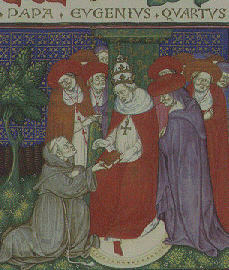 Pope Eugen was the relevant pope of the early Trionfi time, a very controversial person. He made Ferrara to the place of the council, so one must assume good relations between Niccolo III. d'Este and Eugen or congratulate the diplomatic genius Niccolo, who got the best for Ferrara and himself from this difficult man.